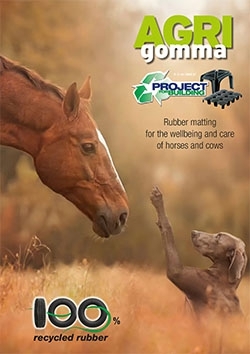 AGRIGOMMA is the innovative mat designed to give max­imum comfort to the animal. improved hygiene for the environment and for the an­imal; as it is extremely easy and fast to clean the stall and the surrounding area, all organic fluids can be eas­ily removed from the mattress, when using either the smooth or ribbed part. excellent stability for the animal, as there is excellent grip between the hoof and the surface, thanks to the mat’s innovative composition which eliminates the risk of slipping and falling. resistance to the pressure exerted by the animals’ hooves, especially when getting up; the mat does not move and will not warp. It is not susceptible to any kind of attack by organic and non-organic liquids. There are also more practical aspects, connected to the well-being of the animal. For example, the product can be fully customised, both in terms of thickness and length; this contributes to improved hygiene, as com­bining many small mats would create a greater risk of organic liquids seeping below the product, which could result in the formation of mould and may produce bad odours. With a single piece the probability of seepage is virtually non-existent. It is ideal for use in stalls, litters, corridors, wash­ing areas and horse walkers. Agrigomma is obtained by fusing two raw materials both in their second life, in full compliance with corporate pol­icies envisaging the use of 100% recycled material. It is made of polyethylene, regenerated in-house, and ground rubber made from the tyres of scrapped cars.